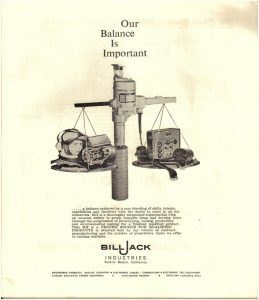 William S. Jack came out of retirement in the late 1940s to establish the Bill Jack Scientific Instrument Company. While he became well known for his forward thinking and innovative business practices, his legacy also includes the row of Quonset huts that now house businesses in the Cedros Design District. These lightweight, semi-circular, prefabricated structures, used primarily by the Army, were attached together along Cedros Avenue. 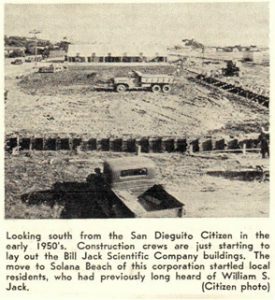 “He put the Quonset huts up because he needed a place for people to work quickly,” said Nancy Gottfredson of the Solana Beach Civic & Historical Society. 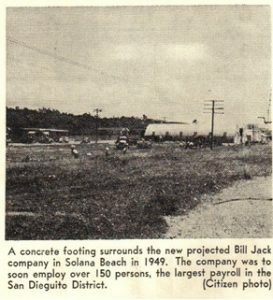 The repetitive roofline of gentle curves quickly became a landmark in Solana Beach and, later, many of the Bill Jack huts have been reconfigured into shops and restaurants. Jack’s company, which employed about 600 people, built, among other things, reconnaissance photographic equipment, motors, tachometers and police helmets. In the early 1950s, it began making helmets for fliers who were just beginning to break the sound barrier. “Indy drivers wore them, too,” Gottfredson said. Jack was ahead of his time in his concern for his workers. He called them “associates” and treated them like partners in his business, sharing profits with them and helping them buy homes, Gottfredson said. Much was learned about Jack and his business quite by chance. When Dave Hodges, former owner of the Belly Up Tavern, was remodeling his Quonset hut, he found a box of news clippings and other memorabilia about Jack and his company, which he turned over to the historical society. From that box, Gottfredson and other historians learned that Jack’s story began in Cleveland, Ohio, where he was born in 1888. According to a yellowed, undated clipping from the Maple Heights Press in Ohio, at age 15, Jack quit school to learn the die-sinking trade. In May 1917, Jack started his first manufacturing business with $2,000. Soon after, he earned a government contract. He had four months to finish the project and earned a bonus for every day the project was completed under deadline. Jack finished the project in 45 days and made a huge profit. He used it to begin other manufacturing enterprises, which he built up and eventually sold. One of the sales changed his life. It was agreed he would stay on as the manager after the sale, but after a disagreement with the new owners, he was fired from a business he had founded. This motivated him to organize another business that would put the needs of the employee first. Sandra Bigsby’s father, Andrew Lev, worked at that first innovative plant in Cleveland. She remembered her father talking about his work there. Because of government contracts, the workers were needed 10 hours a day, six days a week, to make aerial camera control systems. “It was wartime,” said Bigsby, 62, of Del Mar. But Jack made it worth their while, she said. At 4 p.m. there would be a break when food was provided along with massages. There was a steam room and gym on site. Jack also paid for life and health insurance for his associates. Vacations were paid and not just the time, but the travel, food and lodging at resorts. Jack eventually turned the business over to his nephew, Clayton Jack, who ran it until the government contracts were completed.